It's that season again again--my favorite fruit season in Sicily--the season of blood oranges! If you've never been to Italy, you might not know about blood oranges. Most of them are grown in Sicily and we who live here are the lucky vitamin C recipients of them. A California website had this to say about them: "Classified as a sweet orange, blood oranges are thought to have originated in Sicily back in the 17th century, where they still flourish. Cold nights and mild days promote the presence of anthicyanins, the pigment responsible for the fruit's deep red color. For this reason, both California and Texas lead U.S. production of these special citrus." They get redder inside and out as they ripen and are as delicious as they are beautiful. You can stop into just about any bar or cafe and get a glass of freshly pressed blood orange juice (pressed while you watch). January and February are the best months for them. There seems to be another bumper crop this year and they are so, so cheap! 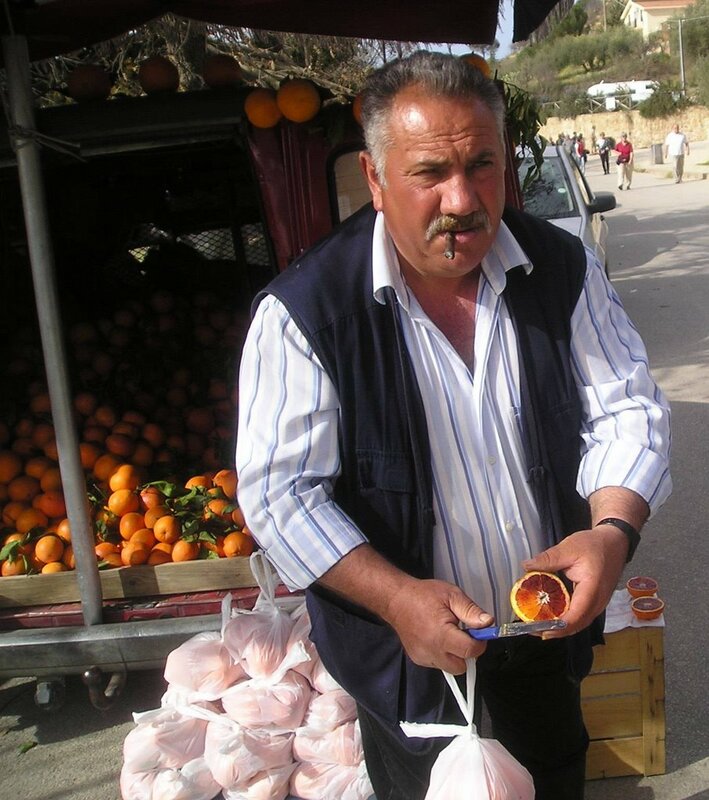 I stop at one particular roadside stand on my way home from work that has the best, sweetest, freshest blood oranges. A crate of them sits in the driveway with a 5 Euro sign on it. I pull in, and someone comes out of the house and gate with a plastic bag and empties the entire crate by hand into the bag. Then I hand over a whole five Euros (about six dollars). I weighed the first bag at home--20 pounds of oranges! That's 30 cents per pound, and every one of them is perfect and delicious. Some still have the stems and leaves attached to them, and somehow these are the best. I had my first one today. It was scrumptious. It was from the batch you bought. It brought tears of joy to my eyes! Imagine that! All from a piece of fruit! I use to be in the Navy and have had port calls in Catania were I had my first Blood Orange. I have been telling my family for years about them. Does anyone know were I can order some from? I would really like to share them with my friends and family.